We're almost through the first week of the A-Z Challenge. Power to the people! In continuation of my A-Z blogging tips I'm going to be talking about allowing your readers to see your email. I know what you're thinking. "I don't let people see my email becasue I'm afraid of my privacy being compromised and spam." In the year that I've had my email visible I've gotten 1 spam email that I think came from blogger. ONE in a year. Seriously, who can't handle that? 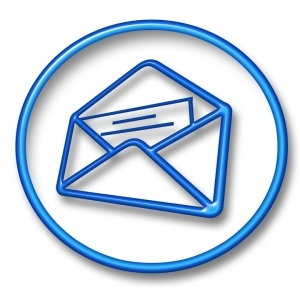 Let me tell you why it's awesome to have your email visible. 1. If you have your email turned on and you leave me a comment, I'm going to email you back. If you leave me a question you can be sure it'll get answered becasue I'll be emailing you. Plus, you can respond back without having to visit my blog again. It's leaves the comment section uncrowded and you can say things that you don't want everyone to see. 2. If I want to get in touch with you and ask you for a guest post/ interview/ advice/ award I can just email you. I've found opportunities that I would have otherwise missed by having my email turned on. 3. You'll suddenly find other bloggers responding to your comments through email. You'll be surprised how much I've learned and benefited from conversations with other bloggers. It's really not a big deal to turn on email. I've yet to hear of anyone getting hacked and a good portion of friends have it on. The benefits are worth it. That's it! What are you waiting for? Mine must be on, as I get a lot of comments via email. It's also listed in my profile and on my bio page. So true! I love being able to reply through email to my comments. It's a great way to strike up a conversation and form real frienships with others. Great way to stay in touch and communicate! Having a contact e-mail is definitely a good idea. I spell out parts of my address (bathroom DOT monologues AT, etc), which does an amazing job of fooling spammers. Some A-to-Zers have already gotten in contact that way. It's so handy. It's also netted me a few writing jobs. I haven't made my e-mail public on my old blog after getting some nasty, abusive e-mails from readers of my old Angelfire site. One person sent me abusive e-mails under several different addresses, all of them ranting about the fact that I have very liberal politics. Some of them were sent by the sycophantic friends of the mentally unbalanced woman who caused my old site to be deleted. I'm really wary of something like that happening again, even though I don't even discuss heated issues on my new blog. I need to check this. I have my email listed on my site but never thought to turn it on in my blogger dashboard. I definitely get a lot of comments through email (and some fan mail). I give my email widely available, but I don't use others to answer their comments. I got my first email from am aspiring writer the other day, asking for advice - that made me happy! Thank you for this explanation. I wonder if Wordpress is similar. That's a pretty helpful tip. Let me check and see what I have for my settings. Hmmm, I wonder if I have this feature turned on. Off to check. This one I didn't know, but all of them have been great. Responding to comments is why I love email notifications. It's so much easier and neater to reply to people that way. I love responding via e-mail! It's so much easier! Mine's on, and I have never had any problems. Have a great day! I'm a fellow A-Z Challenger. Kathy (780 on the list) They must have updated the list. I was 794. Great Post!